I can’t believe it’s already October! With Halloween quickly approaching, I wanted to share my picks for my Top 10 favorite Halloween resources. The great thing about all of these resources is that they are FREE! Thank you to all of the wonderful teachers who created and provided them for us to use with our students! I’m starting off this countdown with a resource for listening. This is something I want to try to incorporate more into my lessons and I think students will really enjoy these pieces. Limelight Magazine has compiled this list along with YouTube recordings for each piece. You don’t have to do any searching…it’s already been done for you! For my students, Halloween is all about the candy! This activity takes their love of candy and turns it into a fun way to practice rhythm. Coming in at #9 is Rhythm Candies by Ashley from Elementary Music Resources. Stock up on candy and start creating rhythms. My students have been loving this activity called Make Candy Count by Leila from 88PianoKeys. Katie from Midnight Music shares some really creative tips and tricks to create spooky music with GarageBand. Students will love the exciting sounds they can make with these ideas that are easy for students to create. These monster alphabet cards are super cute and I can’t wait to use them with my students this month. Melody from The Plucky Pianista gives four great game ideas to use with these cards. I’m going to make up some sharp and flat cards to add to this set and have my older students spell chords and scales with them. Kristin from Earn Training and Improv has provided several themed worksheets focusing on intervals, rhythms, note names, musical terms, and more! These worksheets can be used in private lessons and can be adapted for group lessons as well. There’s sure to be something that your students will love in this jam-packed resource! These “simple, fun, and fast” activities are a great way to keep students engaged through all the hustle and bustle taking place around Halloween. Andrea from Teach Piano Today is always coming up with great ideas and resources and I know you’ll love her Halloween Practice Activities. These cute candy corn notes from D’Net at Layton Music are sure to get your students in the mood for Halloween. My students really enjoyed this activity. In the past I timed each student to see who could match all 16 candy corns the quickest. This year I think I’ll try to see who can match the most correctly within one minute. This way, there is more of a time frame for the game. Or I might pair up students and create teams of two to see who is the fastest. Either way, it’s going to be fun! Have you gone cup crazy? There are so many wonderful ways to use cups in lessons…from Rhythm Cup Explorations by Wendy at Compose Create, New Ways to Use All Those Cups by Leila at 88PianoKeys, and Chord Pong here at Fun Key Music. 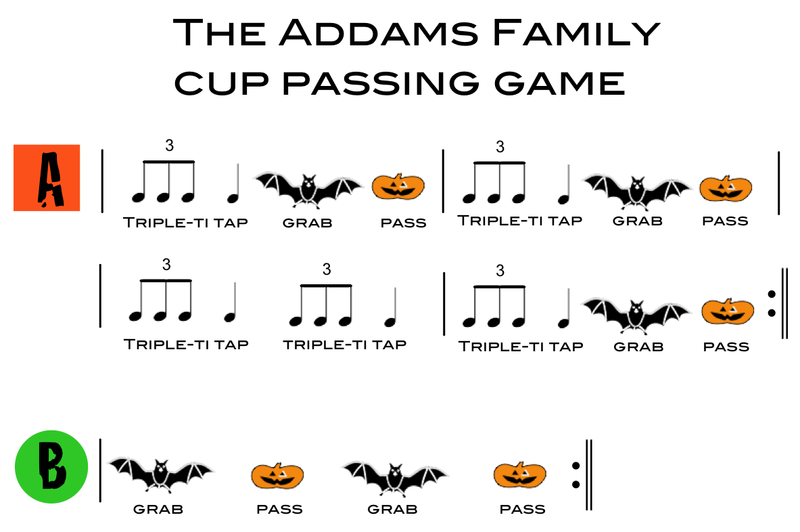 If you haven’t gone cup crazy yet, this cute Addams Family Cup Passing Game is a great way to get started! Jen from Pianimation has great instructions on how to use these song starters for a composition activity. I will be having my students create their compositions in their private lessons and share them at our group lesson the week of Halloween. If all of the songs are done in time, I’ll make a copy of all of the students’ creations for a Halloween themed original composition songbook that each student can take home with them. I just love the bright colors and graphics of these rhythm slides. Paired with the cute Halloween themed phrases and endless possibilities in how you can use this resource, Halloween Rhythm Slides from O For Tuna Orff is my pick for #1. There is a second version of slides using eighth notes, quarter notes, and quarter rests for your younger students. I plan on using beat strips that I have printed with 4 pumpkins to represent 4 beats and have students place flashcards, candy corn, or draw notes on the pumpkins to match the rhythms that they hear. What a great ear training exercise! After the ear training, you could extend the activity and have students link a few of the measures together and use the rhythms for the basis of a composition or improvisation. If you love these ideas and are looking for even more inspiration, I have over 100 other Halloween music resources on my Halloween Pinterest board. Happy Teaching and Happy Halloween! Pot of Gold Resources and Giveaway! I love this post! So many cute ideas to incorporate into lessons this month! Thank you, Christy! I’m glad you love it. So many great teachers with so many great ideas. I’m glad that we can all share and learn from each other and our students benefit from it!